Wow, you made really nice progress, keep showing photos, looks nice job! Hi guys! 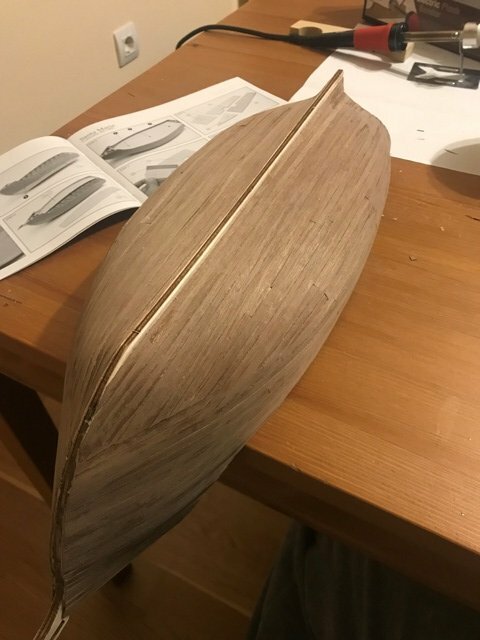 I have finished the hull planking with some questionable results but I guess this is normal for a beginner. As you can see, the second half of the hull is more clear as I gained some experience with the first side. 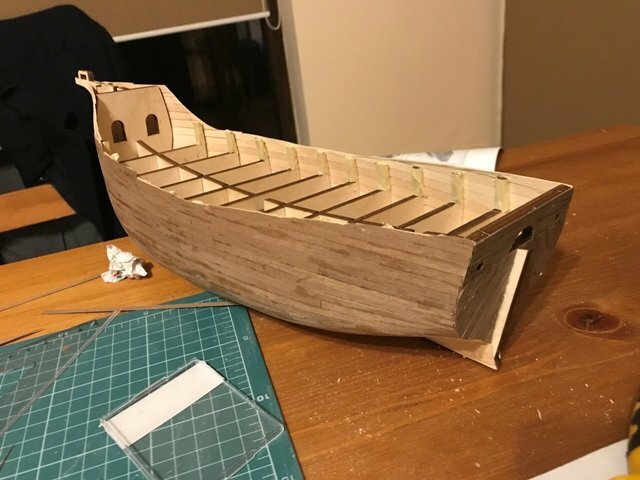 I had some problems with the garboard plank also. Unfortunately I fixed it too strongly to the keel with a clips and it left a small gap. I intend to cover it with some scratch wood which I have gathered in the sanding process and mix it with PVA glue maybe. This is the hull after sanding it a bit. I managed to sand down the inconsistencies. There are some little gaps here and there but thy are filled by scratch wood. 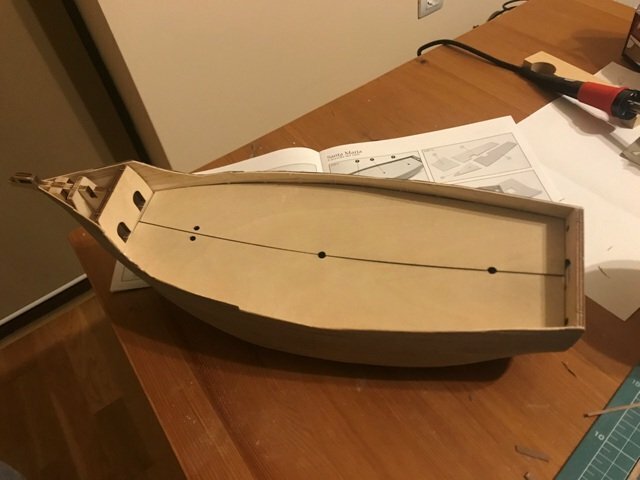 In the next days I will concentrate to finish plank the upper portion of the bow and stern. 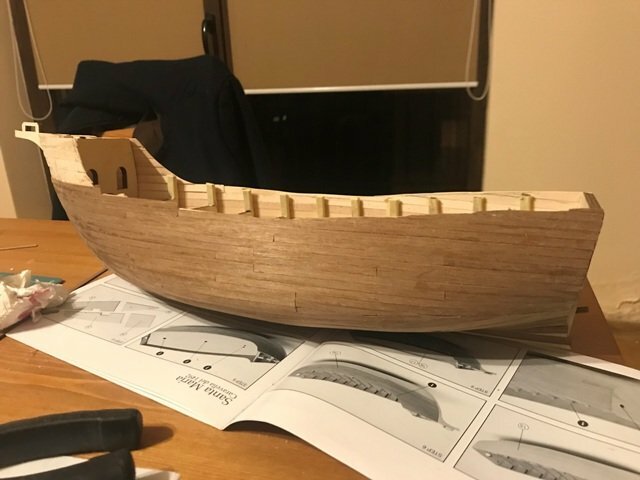 WOW that is such a step and a landmark stage - what a difference it makes closing in the hull with the first planking, and making a good job of it(trust me thats come up ok) the hardest part covering the frames is over, your next job sanding the planks should be more enjoyable. Try to find something plyable/fexable and bendy to sand with - I used to use those decorating sand sponge blocks, as they will follow the contours, also I and probably everyone else on here uses those small flexable nail file strips (not on our nails though) they are great for smaller areas also some different grades of sand paper or wet and dry is also very helpfull - cutting them to the size you want. 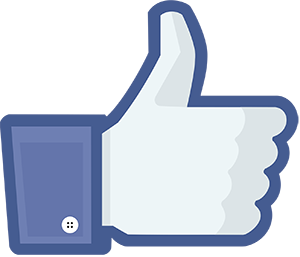 Great progress and keep up the good work - you are doing fine. well done oliver! get yourself a good, easy sandable filler and apply a skim coat over the entire planked surface. 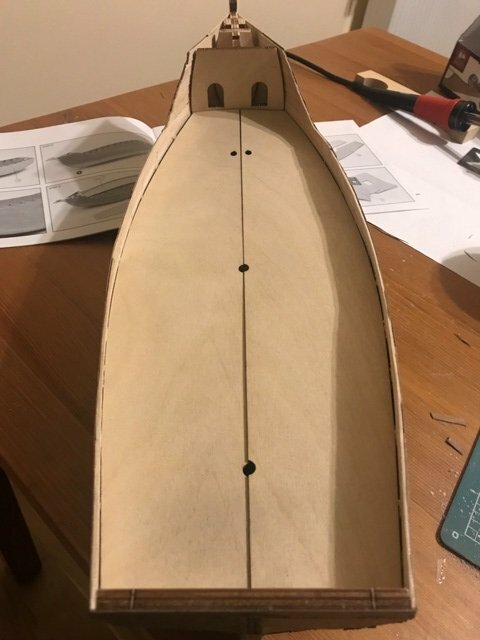 once it has thoroughly dried, then sand the hull until it is smooth and all the little gaps have been filled with filler. remember, this version of the hull wont be visible once you apply the second planking, so it doesn't matter how much filler you use really. just make sure that it will take the final planking strips. 99.9% of them would though. you will find the second and final planking easier I reckon. the strips in this kit are thinner, and much more pliable. I have seen on more logs that some builders use PVA glue and wood sand to fill the gaps. Is it a good idea? The value of using sawdust + PVA as filler is that it will match the color of the wood. Because the color does not matter on the first layer of hull planks you have completed, I think you will find it more convenient to use a commercial wood filler. 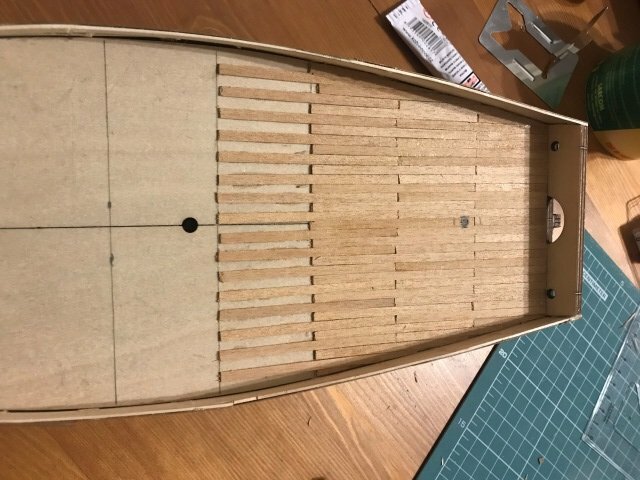 If there are gaps in the second planking of the hull, you can use the sawdust + PVA method at that time. Peter I followed your advice and I bought some wood filler. Funny thing is that I managed to buy a very close colored wood filler, even as you said, this is not important. I gently applied some as you can see from the photos. I also trimmed the bow as you can see. This was very tricky because the trim level must be the same on the opposite side of the hull. I did a fair job I guess... Now I am waiting it to dry and I will begin the final sanding process before applying the second planking. Here are some photos of the second planking. 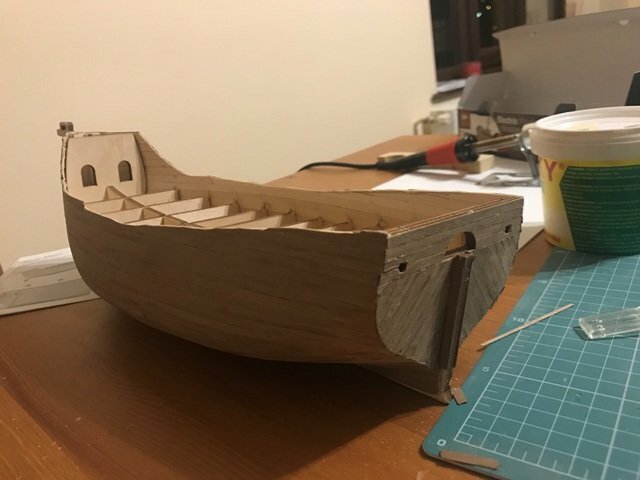 I was a little bit surprised that dough the planks are slimmer, at the end the shape of the hull forced me to follow the same planking positioning of the first planks. I would have preferred more straight lines at the bow and center of the hull... What do you think? 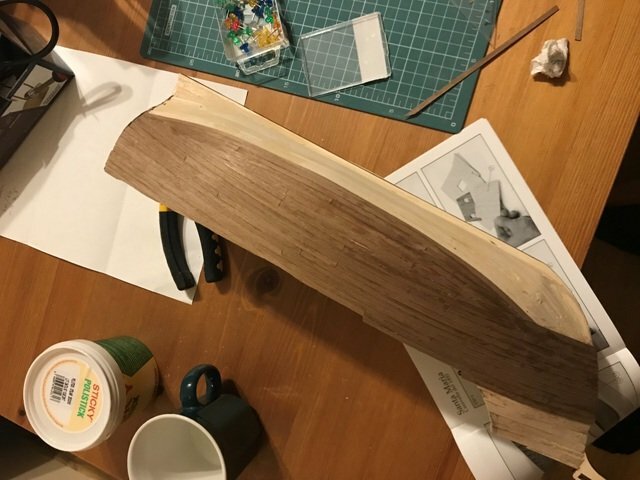 I have a further question: in the process of the second planking some strips got excessive glue and maybe you can see that in the first picture. Will the second planking be sanded as well? 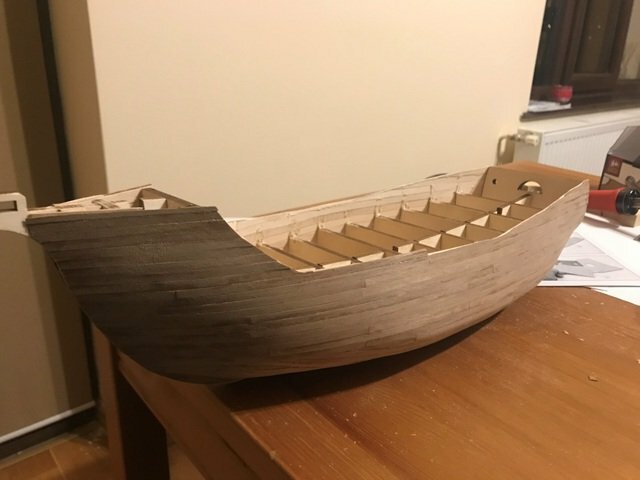 I intend also to buy some danish oil or tung oil just to darken a bit the second planking and to emphasize the old age of the ship. Any suggestions? 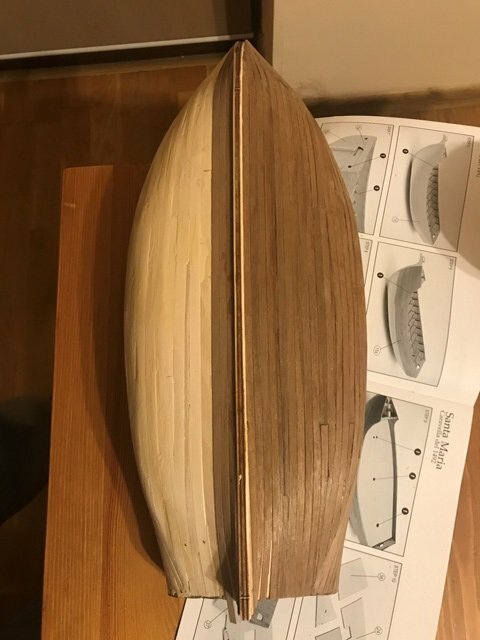 Looking good, you are on the right track, the thing I have discovered with wood kit building - its all about practice and repertition, the more kits and time at the bench - the better you/I and everyone become. Very nicely done. As your first model, i can say your work very fast. You will use some varnish for finish? Hi zappto! I am still not decided how to fill some of the gaps of the second planking. I found the second planking quite difficult due to the thin planks which tended to snap very ease on the horizontal. 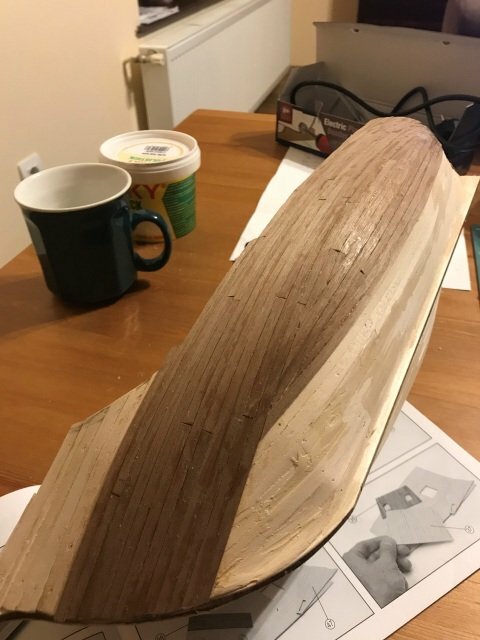 I guess I will sand the hull after finishing and see if I will manage to close the gaps. For a finish I searched like crazy for danish oil, but I could not find any... In our region in seed oil is more at hand. I am thinking also to order some tung oil. All in all, my purpose would be to darken a little bit the second planking. Not really sure what type of oil would fit best. Second planking is finished. I will continue to sand it and afterwards I will use some tung oil/danish oil (I still did not found any). Now I am in the process of attaching the false deck. 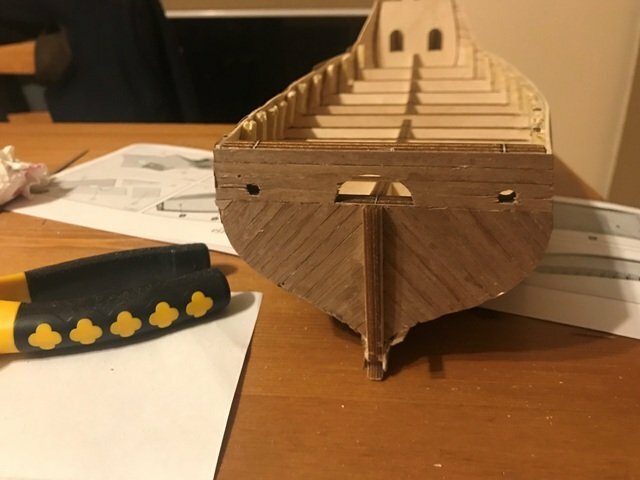 This proved to be a little bit tricky because the initial shape of the false deck did not fit perfectly on my bulkheads and some ugly gaps appeared between the hull planks and the deck. I sanded the edges of the false deck and slowly it is taking the right shape as you can see from the photos above. 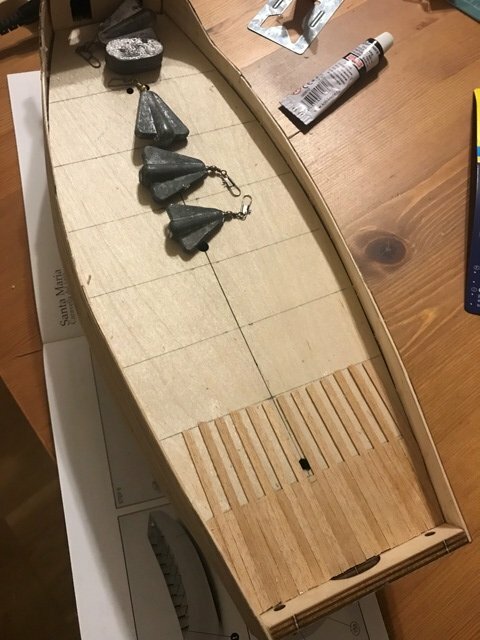 It still needs some adjustments on the stern area... My plan is to attache the deck first and apply the deck planking only afterwards. Doing so will avoid eventual warps of the deck planks afterward. What do you think? She is coming on good, work with second hull lanking has turned out nice and smooth, with the false deck - dont worry too much as long as its flat and you start wirh a plank down the center, you will not notice the gap. I have started the deck planking process. 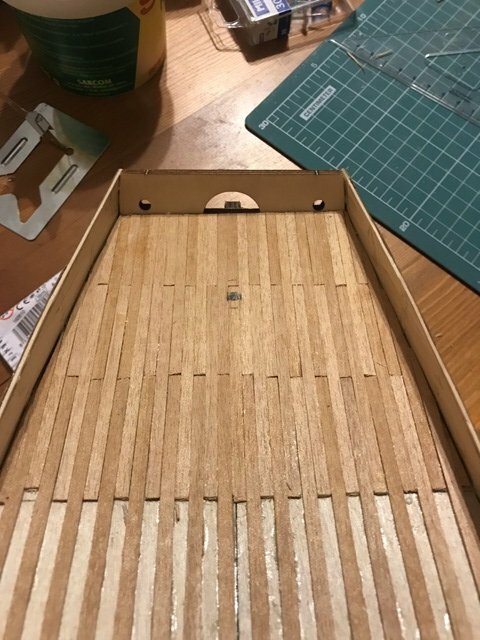 I have tried to place the false deck as straight as I could but unfortunately that did not work out very good. As you can see, for some reason the deck is not straight at the stern... However, I would not rip it off, because this part will be covered with a second deck, so I believe that it will remain as you see from the photos. This is clean looking work, all seems neat! Now you have nice shape to work on. Why did you paint front part black? It will have doors there? I was absent for quite some time due to work and MA studies. I still haven`s finished my Santa Maria but I will not give up and eventually it will be finished. @Zappto, you guessed it right, there will be some open doors from the deck. She is looking very very nice. Here are some pictures about my progress. I had no problems with the ladders, however the rudder was a pain in the ***. The metal sticks which must be attached to the rudder came with no pins and it seems to me that smaller pins were necessary that the ones used in other parts of the ship. I used the bigger "standard" pins and bent them after but it was difficult and not very pleasing. Did I miss something? 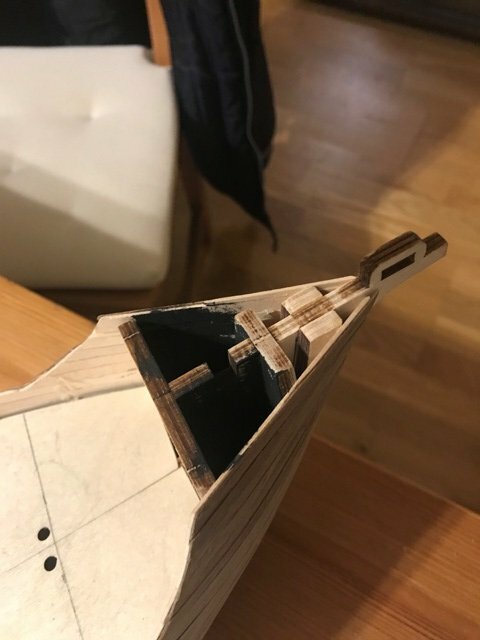 Moreover, the "V" shaped metal sticks must hold also another little piece which enables the rudder movement which I struggled to fix and eventually tried to glue. What is the correct procedure here?? I have problems also with the fixing of the dead eyes. The instructions provide that a slim metal line should be fixed around the dead eye and the extremes must be bent. I tried to do this but I never managed to exercise such pressure to the line to actually hold still the dead eye and it remains somewhat loose whatever I do. What should I do?? Don't worry about the deadeyes being loose, because the shrouds will hold them in place once you attach them. What you will need to be careful about, though, is that your wire strop is sufficiently long enough to form the little hooks at either end; you'll need those to keep the strops firmly attached to their chainplates. Your done wonderful progress! Looks real nice ship! Those dead eye line going around them, try to make it loose at first, later can place small vire to wrap little hooks line in the middle. It will make it not loose at all. It is just my opinion. what I see is that you have perseverance and passion, key features for this hobby, and more! keep on doing so you have made "giant" steps and you will surely make other ones, your model, to be the first one is doing well! Metal, except for a couple weird alloys, will always bounce back after being bent. So if you want to bend it to closely follow a curve, you have to bend it farther than that either by hand or by using a form with a smaller radius than the intended final curve.